In the event of a fire the primary objective is to protect people, processes and property. This can be achieved by installing some simple fire safety equipment. Fire extinguishers, fire blankets and fire hoses installed in the right locations throughout your property can significantly reduce the cost of fire damage. There is a wide range of fire suppression solutions available which can accommodate the varying needs of commercial, industrial and prestige buildings. For example; temperature controlled environments and locations where high value, easily damaged equipment such as computer systems are stored, or large or inaccessible areas. Our team of fire protection and prevention specialists are accustomed to dealing with most circumstances and can recommend which fire extinguishers should be used and other fire safety equipment for every business. We supply, install and maintain a comprehensive range of fire extinguishing products from leading manufacturers. All products we install comply with strict industry quality standards, BAFE, SSAIB and ISO accreditations. We also offer a range of fire extinguisher maintenance service agreements which will help ensure your business is compliant. If you require additional or replacement fire extinguishers or fire blankets we carry a wide range in stock to suit all applications. 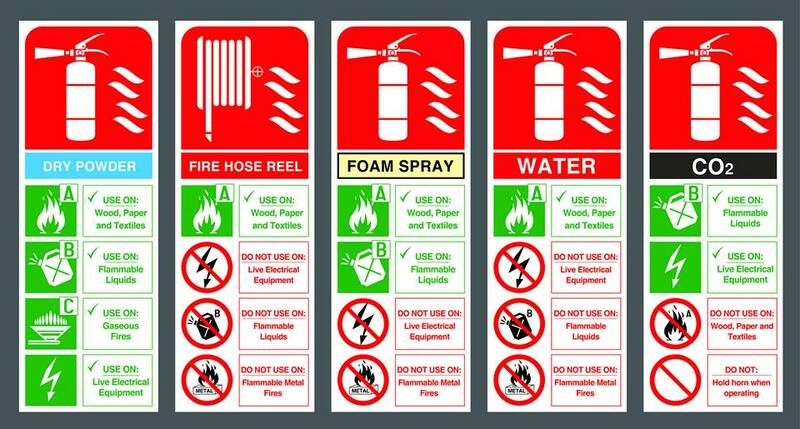 The guide below will help you choose the correct fire extinguisher with the right symbol for the environment in which it will be used. If you would like to order fire safety equipment, please call our sales team on 01773 764626, email sales@tecservuk.com or complete the enquiry form.